Disk space is never enough. On an on-going basis system administrators will be getting request to increase the disk space on a server. 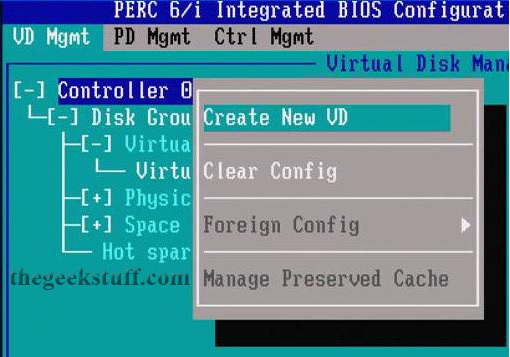 In this article, let us review how to add new physical disks and create a virtual disk with a RAID configuration on an DELL PowerEdge Server using PERC 6/i Integrated BIOS Configuration Utility. The new DELL Servers has the ability to create RAID 0, 1, 5, 6 and 10 using the hardware controller. Assume the scenario where the server came with 2 physical hard drives configured in RAID-1. This Logical Volume is where the operating system is installed and you got a request to expand disk space on this server. So, you have purchased additional disks and would like to configure a RAID setup. In this example, 4 additional disks are configured as RAID-5 on a DELL PowerEdge 2950 server. The same steps works on other DELL PowerEdge servers as long as you have the same PERC BIOS Configuration Utility. 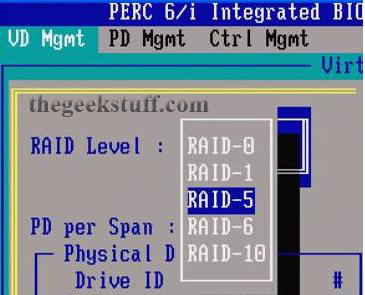 If you are using an old server that uses PERC/CERC BIOS Configuration Utility, please refer to the article we wrote earlier about how to create RAID on DELL Servers using PERC/CERC BIOS Configuration Utility (with screenshots). First, insert all new disks in the empty slots. If there are already disks on slot 0 and slot 1, start inserting the new disks from slot 2. In this example, the new 4 disks are inserted from slot-2 to slot-5. After the disks are inserted, reboot the server. When the server is starting up, press Ctrl-R to launch the PowerEdge Expandable RAID Controller BIOS. Press Ctrl-R when it is displaying the following message on the console. This will launch the PERC 6/i Integrated BIOS Configuration Utility. This utility will have the following three TABs on the top. VD Mgmt – Virtual Disk Management, which will be selected by default. From the Virtual Disk Management, use arrow key and select ‘Controller 0’. Press F2 to show available operations for the ‘Controller 0’. This will display a pop-up menu with following choices. Select ‘Create New VD’. Press Enter on the RAID option, which will display the following RAID choices. In this example, I choose RAID-5 as shown in the Fig below. After selecting the RAID Level, press TAB and jump to Physical Disks section. This section will display all available disks that are not configured yet. Every physical disks will display Drive ID and Size. Press space bar to select the disks. i.e the check-box in front of the physical disk will be selected. Once you’ve selected one disk, it will automatically jump to the next available disk. Keep pressing space bar until all available physical disks are selected as shown below. Since I have selected 4 disks (each 139G) for RAID-5, the total usable space would be around 3x139G, which is approximately 418176MB. This total size is calculated and displayed automatically in the VD Size under basic settings. You can also assign a name to the VD. I’ve left VD Name field blank. I recommend leaving all the advanced settings to the default values. Press TAB to jump to OK and press enter. You’ll get the following warning message. Click OK to continue. This will successfully create the new Virtual Disk with RAID-5 configuration. Warning Message: It is recommended that all newly created logical drives be initialized unless you are attempting to recreate a previous configuration and recover data as initialization is a destructive process. When you’ve entered all the above values, the whole Create New Virtual Disk Screen will look as shown below. Once the VD is created, you’ll see a new ‘Disk Group 1’ under ‘Controller 0’. There will be a progress bar next to the ‘Virtual Disk 1’ showing the progress of the initialization. Expanding Disk Group 1 will display the following sub-items. Use arrow key and highlight the Virtual Disk 1, which will display the following properties of both Virtual Disk and Disk Group on the right side. The new disk configuration is now complete and available at the OS Level. Make sure to format and partition this new Virtual Disk at the OS level before mounting it. What a coincident! We happened to get a Dell 2950 RAID 5 server today and I saw your post. Thanks! I’m glad I was able to provide the insight on the RAID controller configuration screen. Once you start using it, you’ll notice that it is fairly straight-forward and easy to understand. Yep.. that is definitely a great coincidence. I really like the new RAID conrollers on Dell servers, as they have the RAID-5, which I think is an better option without sacrificing the fail-over capability, as if one drive fails, your data is still not lost. 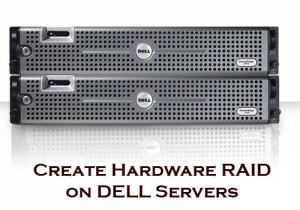 So, did you end up setting up the RAID 5 yourself on the new DELL 2950 Dell server? How did it go? Use write through and not write back! I found this post when experimenting with a new Dell PE T300. It has 4 hard drives. 3 are set as a virtual drive and the 4th is a hot spare. I then am trying to expand the array to 4 active drives. Is that doable? Adding a 4th drive to an array and have it expand (say each is 100 GB. So initially you have 200 GB with the 3 drives in raid 5. we want to add a 4th drive to bring the usable space to 300GB. I am doing this from the control R controller noted above, but I don’t see an expand feature. And I don’t know what windows app I should be installing to be able to manage / monitor / control the array from inside windows server 2003. any advice? As I tell my kids, RTFM – read the _____ manual… or at least look at the CD that came with the server. That has the open manage app and lets you do more than you can at the Control R screens to expand an array, etc. used to connect a MD1000 from Dell. (the card does not display it’s bios boot message saying “hit ctrl-r for perc 5…”). I tried a different PCI slot and riser but with no luck. Is out there anybody that might give a hand fixing this? i shut down a dell poweredge 4400 and on restarting I get message that POST was successful and BIOS installed was successful. A check for array return a mirror and a raid 5 all being OK. It reaches reading scsi id 5 as the cd rom drive. It reach this point and hang it does not load windows NT 4. I have no error message or beep code. I cleaned the system but still at the same position on restarting. I had to service the DC so I just shut down the system, now i can get it back on. there was no sign of system failure. I have storage (MD1000 SAS) with eight (8) hd of 500GB, for some unexpected reason it lost its configuration and is not recognizing the drives in which I very precious data. I have tryed to import back those disk but, an error ocours with an unckown code number. I wonder if anyone has had this type of trouble and what was the solution? Is it possible to clear the perc´s 6 configuration of the virtual disk without harming my physical hds, because of the data that holds? i need help here! i already expand the HDD. my server R710 have 6 slot of HDD. Existing we have 3 HDD(450 Gb) and i upgrade another 3 HDD (1 Tb).that mean my HDD slot is FULL. But… after i reboot my server… this error come : Alert : iDRAC6 not responding. So i decide to unplug all 1TB and cancel my upgrade. And again i restart the server this error still occurred. For your information, we only have 1 power supply on this server. can somebody tell me what to do next? do i need buy another power supply? or do i need upgrade my iDRAC6 firmware? I have dell power edge 2950 and one SAS drive 146 GB (windows server 2003 & web application server installed) . 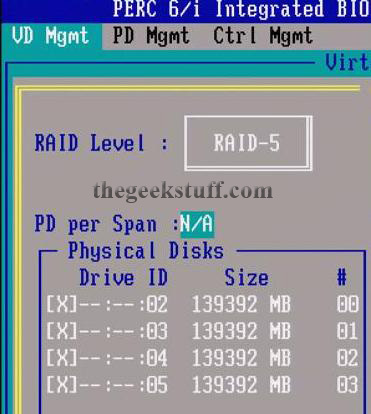 You need at least 3 drive to configure RAID 5. You can use RAID 1 (mirrored) with 2 drives, but you get no additional capacity. You will need to backup your old drive first, as it will be wiped when the RAID array is initialised. You could also use RAID 0 with two drives (or more) to increase the volume capacity but there is no redundancy. I would recommend you buy a third drive and used RAID 5, which will give you approximately 2 x (146 * 0.93) GB = 272 GB capacity and redundancy. You can then add an additional drive to the array later to increase capacity further. A small question regarding above article, the author mentioned that he selected 4 disks (each 139G) for RAID-5, the total usable space would be around 4x139G, right? (total 556G). but he mentioned 3X139G, where did the other disk go? Assuming that I have a brand new dell server with 4 disks like mentioned above and I use above configuration to set up RAID-5 and then I will install Linux OS on it so it has redundancy for the data. If I would like to expand space on the server, simply I would purchase say another 3 disks and configure RAID -5 on it and then format them through OS and mount it and then use this space for applications. Is that correct? Sorry for asking such a stupid question? – You can do two things: A) Add the new disk to your RAID controller and expand your array. And you’re done. B) Add the new disks to your RAID controller and create a new array and mount this new array in your Linux installation. On the legends of some screenshot, you say that they come from R200 or R300 servers and the screenshot showes a Perc 6/i. Do you really use perc 6/i on R200 or R300 ? I would like to use such config but Dell tells me it’s not possible. thank you sir, these information is really helpful for me. I have PE1950 server PECL5i raid controller. 2 SAS disk with mirroring of disk size 73GB each. I want t to upgrade the SAS disk in to 300GB each. Without OS and database crash. Can anyone confirm that if I replace the controller, the disk config and data will survive ? I now can select disks. When selected 4, I get 304128MB. Nothing before. When I select all 6, I get 456192MB. I am not sure if I am mirroring or striping first. How do I mirror first, stripe second? Is there some way to check this? How would I do the “other”, stripe first, mirror second? Hi Guys. we just got the Dell Power Edge T610 server today with the 8 X 600Gb hard drive in and I set the first 2 drives up in RAID 10 and drives 3 – 6 up in Raid 1, however I need to configure the remaining drives as hot spares to one of the partitions. Any guidance on this would be much appreciated. 1. On the VD Mgmt screen, select Virtual Disk # and press to display the menu of available actions. 2. Select Initialization and press the right-arrow key to display the Initialization submenu options. 3. Select Start Init. to begin a regular initialization or select Fast Init. to begin a fast initialization. 4. A pop-up windows is displayed indicating that the virtual disk has been initialized. 5. Repeat the procedures from step 1 to step 4 to configure another virtual disk. The PERC H700 or PERC H800 cards support up to 64 virtual disks per controller. The currently configured virtual disks display on the screen. Many thanks for this help. We bought a new PowerEdge with no DELL disks and with the Mgt CD ROM and this article. it was easy to find a solution ! Please provide the tutorial for SAS 6/iR with screen shots. I’m using Dell Server Poweredge R300 and the OS: windows server 2003 R2 standard edition. Currenty it have 2 SATA hard drive and it has already being used as a web server. So how can i configure as Raid 1 without affecting the current data on the hard drive. Your prompt response is highly appreciated. Thank you. I created a 6 disk raid 5 and a 2 disk raid 1 drive. I Initialized the drives put in windows server 2003 then rebooted. When I try to install wndows it cant find any drives? I have already double checked to make sure they were all online. We have a Power Edge 840 with raid 5 on three 250 GB disks and a PERC5I-ADAPTER. Can we expand the raid drive add a fourth physical drive without losing data?? But i still have some with installing Windows server 2003 on PE2900. i have 5 SAS drives 73gb each. but when i run set up cd, windows cd cant detect any hard disks. if i try to install windows server 2008, the disks are detected. pls help as some say i should load prec drivers.. no solution. Thank you very much. Excellent information guide. Were you able to figure out if using the Perc 6/i card and reconfiguring the existing virtual Drive wiped or kept the data intact? Trying to go from exisitng 2 drive Raid 1 and expand it to Raid 5 and reconfigure the Virtual Disk. Fig: Press Ctrl-R to Launch DELL PowerEdge 2950 III Expandable RAID Controller. I havent installed any HDD in the SAS RAID controller bay. Is that the reason? I want to be sure my RAID controller works when I buy two SAS HDDs. Now, I’m using SATA HDD connected to the SATA connecter cable. No worries, after a full backup to be safe. I can confirm that using the Dell Utility – It will reconfigure the Raid 1 to a Raid 5 and you WILL NOT lose any data. So the controller is smart enough to distribute that parity during the reconstruction of the raid volume. You do need to use Diskpart aftwards to expand the existing volume. It worked like a charm !! Is there a way to change the VD size? In my case, there were two, but now I want to unite these in one. I deleted the one, now how to add the free space to the pther VD? I have Dell 2950 power edge server. Yesterday, I had change one HDD which was faulty. during the RAID rebuilding, one more HDD was faulty now. Now, server was not able to boot. Its give IO INPUT /OUTPUT error. How to Do online these two HDD. Fantastic post, right level of detail and the screenshots were exactly what I needed… clear consise and not to technical. Does anyone know if it’s possible to go from RAID1 on a SAS 6/iR controller to 2 independent disks (i.e. no RAID) from Server Administrator without losing any data? This server doesn’t have a DRAC so I can access the RAID configuration utlity from the POST screens – it has to be done from within Windows (which is on the RAID1 array that I want to reconfigure). I have Dell Power Edge 2900 Server machine with Perc 6i raid controller. i have two hard drive installed with raid 1 and three with raid 5. i need to add two more hard drives in raid 5 without data loss. kindly advise procedrue. I am not much knowledge in Dell RAID cards, Can anyone please let me know what does mean Virtual Disk in the below snippet. Also please let me know what is the use of this? i want to make mirror RAID 1,but also i dont wan to loose my config there of an software is this possible any suggestions. I have set this up however when I try to install Windows 2008 R2 it says that there are not devices found to install the software on. Any help? sir,i have installed DELL POWEREDGE server with 5 hard disks each having 300gb and configured RAID 1 with first 2 HDD AND RAID 5 with remaining 3 HDD.When i was trying to install Windows 2008 R2 Enterprise edition i could not complete it.In the last stage after loading files & updating files its getting long time for “COMPLETING INSTALLATION”.After that window is not moving forward but system not get hanging or somewhat.I installed the os in RAID 1 with a partion of 50gb,even i tried 60gb not possible.Then i tried with RAID 5 alone and followed the procedure,same problem.I checked with another working cd and all but result is the same only.I need to increase the partion size more or should i try with more than 100gb? Please find a solution for this one sir..awiting your reply..
Any help or guidance, most greatly appreciated! I have a dell t610 that came with 2 250gb drives setup as raid 1. My question is: I want to add 2 750 GB drives and either keep as raid 1 or change it to raid 5. Can I do this with the 2 250gb drives and the 2 750gb drives. My concern is that I will lose what is currently on the 250gb drives and I really don’t want to do that since there is many applications running on this server. What would be the best way to proceed without fear of losing my current installation. Had exactly the same problem recently while building a Dell 2950. The solution was to use the “Systems Management Tools and Documentation” cd after you’ve set up the VD. This worked perfectly! Had tried downloading loads of Dell software and setup discs but the only one that worked was the one above. How can Insert new disks without losing current configuration and data and how can see increase the space in drive d of this server? I have DELL poweredge 2900 server with RAID5. It has PERC 6/i. It contains hard drive of 272GB. Now i would like to add two more SATA hard drives of 1TB each without wiping out the data. i have open manage installed in the server also. Can any one please help me out with the situation. Just a note if you can’t see the PERC, there is a BIOS option on Dell servers to turn the PERC on or off. Go into the Dell BIOS and look for RAID configuration on or off. I’ve tried this tutorial, but after the 2 disk inserted, and go to RAID Controller (Ctrl-R), I can’t create new VD. Can any one please help me out with the situation. Man… Kudo for the detailed walkthrough… Keep it up, GREAT STUFFs!!! I have a PERC 6/i controller that I think is starting to die. My question is, can I replace the controller card without wiping the disks? I have a good backup but – I’d rather just replace the card and hope to go on. It’s very useful, thanks very much. This articled helped me when I was setting up RAID 1+0 on Dell PowerEdge T300 server. I have a Dell PowerEdge R610 with two PERC 6/i SCSI 146Gb in RAID 0. I bought two new PERC 6/i SCSI 900Gb and want to install it in RAID 1. Is there any way to do this? What will be the best practice to substitute the two ones in RAID 0 by the new ones in RAID 1? Is it possible to execute this changing without reinstalling the OS? The server had been running for 2 years now. This, has really helped, me. I have a Dell 1950 III with 2 caddies. Does changing the RAID controller for the disk which is already configured will wipe out all the data off it ? Previously I have configured RAID 0 with 1 disk. I have added another disk and changed the controller to RAID 1. Does this wipe out all the data off disk 1 ? Please advise. Funny that you ask. Had this issue yesterday on my 1950 where it lost the raid config. But i reckon the same would apply when putting in a new raid controller? I just imported the foreign config (config is saved on the disk array) and my raid started rebuilding without any problem. Hope this helps? Thanks for this tutorial. It was very nice to review this before going forward with creating my new Virtual Disk. In step 9, your screenshot does not include the progress bar. Also, you sometimes have to press refresh (F5) to get the progress bar to show up (after that it seems to work properly). I’m managing a Dell owerEdge r710, recently i added 4 new 600 Gb SAS Disks, i’m trying to congirure them in a raid configutration following this and other guides but the problem is the Ctrl-R option doesn’t appear, do i havwe to use the Ctrl-C option for SAS disk? Thanks for this info! It was a great help for me. It’s been awhile since I used the Dell drive configuration utility. This got me right thru in in no time! I really appreciate you putting this together with screen shots. Very helpful! How to upgrade from a standard 1xHDD system to a 2xHDD RAID1 setup on a live system with a PERC H310 controller with minimal downtime. HDD bays are hot swappable. I swapped some drives in order to prep for another installation, but I wanted to swap the drives back. But the VD obviously did not save on the drives so when i put the drives in they did not boot because I already adjusted the VD to suite the new drives. I need to use the previously installed drives in the server again. Can anyone shed some light on how I can achieve this. I need to add a disk to an existing RAID 5 array. I’ve done this in the past but it’s been a couple years and I can’t quite recall the exact steps to run through in BIOS Config. I believe at eh time I pulled a “how to” from this site similar to the one in the above post. Anyone know of a good document either on this site or another? I’m from Brazil and thank you for your explanation. It really helped me a lot. Six years after it was published, this post saved me. Simply awesome! We need the Data reside on Server A back online as the Data on those drives are critical for us. Kindly guide us for any consideration and pre-requisite require to follow as we don’t have the backup of this data. you manage a good section for beginners and other also. I newly using Window server and find so many pages for RAID, but there ways was some difficult. At last i succeeded to Configure RAID-5 after reading these steps easily. Thank You so much. Thanks so much you saved my day too! I am working on project, your post is really helpful !!! I have a Dell R710 with 3 x 1TB HD’s in a RAID 5 configuration. My boss wanted to upgrade all 3 drives to 2 TB. Got the HD’s and want to migrate all data over to the 2TB – without reinstalling Server 2008. Thanks alot, this article helped me and solved my problem.